In addition to our casting processes, we use the two techniques mentioned above for in-house products or for smaller production batches for third parties. Hand lay-up and spray-up are open-mould composite processing techniques. We select the best processing method according to the required properties of the product to be designed. The two techniques are often combined. 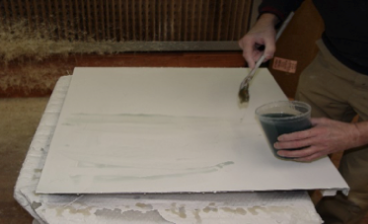 We use the hand lay-up technique in certain circumstances: firstly, when a more precise calibration thickness is required; secondly, when the article to be produced is particularly complex; and, thirdly, in the case of higher reinforcement percentages. Glass mat, glass fibre mat, glass fleece, carbon fibres, aramid (kevlar) fibres, coremat or even jute and cardboard can sometimes be used. For larger items, we can use the spray-up method. 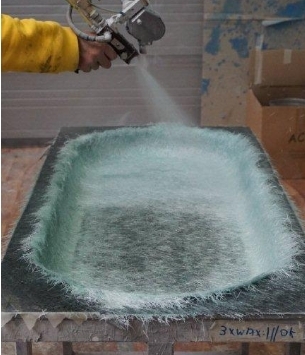 This is usually best in the case of glass fibre tape, also called spray-roving. This is a technique involving a closed mould system that produces a reinforcing element using composite resins. 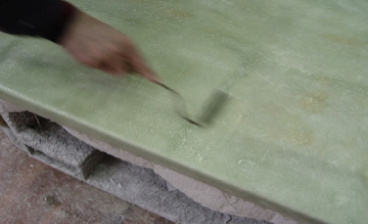 The reinforcement is often manually cut to size and placed in the mould. 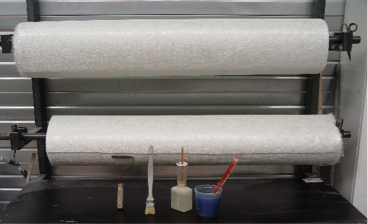 Also, many reinforcement materials can be used, but often in lower percentages than with the two other systems. 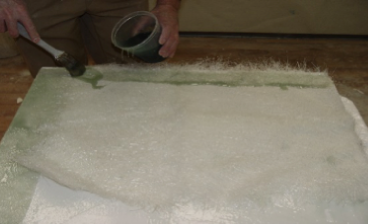 The advantages of this technique include the presence of two "smooth" sides and a significantly reduced environmental impact. We have acquired considerable expertise with this technique but for the time being we do not use it because there is no demand among our existing customers and because the costs are significantly higher.